Jack is 100% Baby Alpaca and is woven with irregular strips of natural, grey, charcoal, black and brown. Jack is accented with a hand finished fringe. 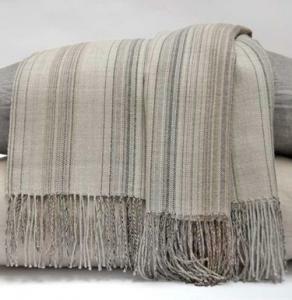 Although Alpaca is very light weight, it is cozy like cashmere without the opportunity for allergy, an ideal a beautiful addition to the armchair or foot of the bed.